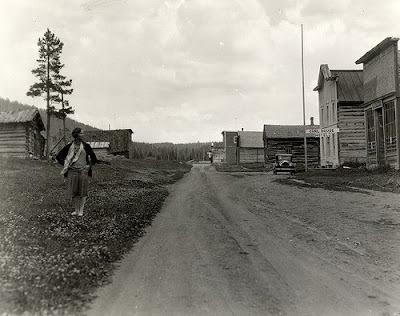 I've always liked the little town of Cooke City, up in the mountains near the Northeast Entrance to Yellowstone Park. It's a quirky old place, and probably has been ever since it was founded as a mining camp back in 1882. Today, it exists mostly on the tourist trade -- Yellowstone visitors, hunters, and snowmobilers -- and has a year-round population of maybe 100 or so. In some ways it's probably the most remote town in the state, especially in the winter, when the only road access involves a long drive through Yellowstone Park. The place is isolated from the Montana road network year-round ... you have to drive through Wyoming in order to get there. Here's an old photograph of Cooke City from the Haynes photo collection ... probably taken in the 1920s or so, before the Beartooth Pass road was built and the tourists started showing up. and I thought I was isolated! Hope everyone likes their neighbors! The woman in this picture is the most provacative part of the image, to me. Great shot. The woman in the photo looks a lot like my mother did in the 30's...today would have been her 96th birthday...*S* She loved wandering all over Montana...RIP, lil' Gypsy.